For many Americans, their first drink of alcohol comes well before the legal drinking age of 21. It might be at a high school party, snuck out of the liquor cabinet at a friend’s house, or even supervised by family. For the majority of teens, drinking before the legal age results in little more than some unpleasant hangovers. However, there are those who will develop alcohol use disorder or even become alcoholics before reaching adulthood. Because teens make up a small portion of alcoholics, most rehabs are not tailored to meet their needs. However, there are teen alcohol rehab options available throughout the country. These rehabs are tailored to the unique mental, physical, and social needs of adolescents, helping them get and stay sober. What is teen alcohol rehab? What is teen alcoholism statistics? What are the unique needs of teenage addicts? What are the signs a teenager needs alcohol rehab? How can parents support their teens in getting clean? How to choose a teen alcohol rehab? Teen alcohol treatment centers are similar to those for adults. Alcohol addiction rehab for all ages involves things like medical and natural alcohol detox, personal counseling, group counseling, and aftercare services. However, there are some ways in which adult and teen alcohol rehab treatment differ. First, there is the importance of family involvement. 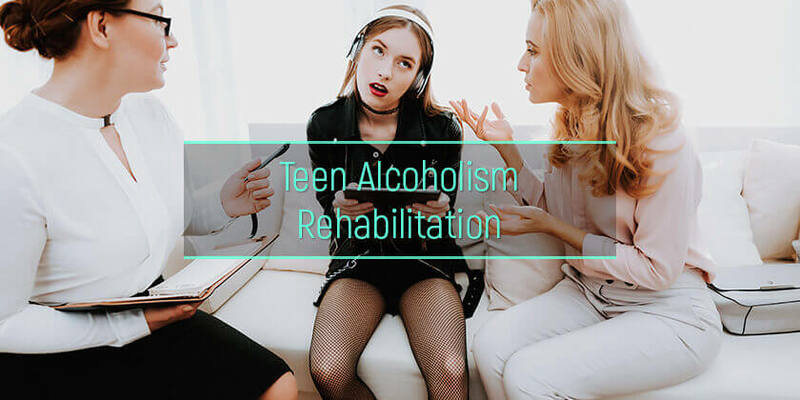 While adult alcohol rehab can also involve family therapy, for teens, family therapy and at-home support are critical to rehabilitation success. Underaged addicts in rehab and recovery rely on family to replace their social circle that is tied to their alcohol use, drive them to their appointments, and hold them accountable. They also need their family to listen to their struggles and concerns about alcohol use. A teen alcohol rehab program will take into account the ways teen brains are different from adult brains. Due to the way their brains are developing and literally rewiring, many adolescents struggle to make logical decisions and approaching them with things like facts and research is likely to get them to shut down. Emotional reasoning rather than logical reasoning tends to be more effective in rehab. Teen alcohol abuse rehab is often outpatient rather than residential. There are two primary reasons for choosing alcohol outpatient treatment for young patients. First, because teens need their families to support them in treatment, it can be better to have them home with them every night throughout their intensive rehab treatment. Second, no matter how nice the rehab facility is, for adolescent craving freedom, a residential rehab facility can feel like a prison. Of course, sometimes an inpatient alcohol treatment center is needed. When residential rehab treatment is designed for teens, they are offered special housing and therapies that are separate from those the adult patients use. 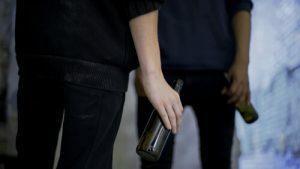 It is also common for teen programs to separate patients by gender, with alcohol rehab for women under the age of 21 being separate from that for young men. Finally, because teens respond more to peer pressure than adult guidance, alcohol recovery group therapy is vital to their success. Outside of rehab, they may be surrounded by peers who encourage their problematic behaviors. In rehab, they get the chance to be around those their age who are making staying sober a priority. For adolescents and their caregivers, it can be easy to dismiss problematic drinking as just a stage. It is often assumed that teens are meant to be a little wild and that as they age, they will just grow out of it. While it is possible that teens will reduce some of their wilder alcohol-related behaviors as they age, addiction is a disease that does not go away without teen alcohol and drug treatment. How significant are teen alcoholism and alcohol abuse in the U.S.? Excessive drinking causes more than 4,300 teenaged deaths every year. Approximately 11 percent of all alcohol consumed in the U.S. is drunk by those under age 20. Around 90 percent of teen alcohol consumption is through binge drinking. Over 5 million teens binge drink at least once per month. Underaged drinkers tend to consume more drinks per year than their adult counterparts. 14 percent of high school students binge drink on a regular basis. The Northeast and Midwest have the greatest concentration of teenaged alcoholics. Teens are at a higher risk of experiencing alcohol blackouts due to binge drinking. Drinking while the brain is still developing makes the risk of alcoholism greater. Put together, this paints a dire picture for teens who drink, as well as their loved ones. However, teens who do develop problematic drinking habits can be helped by attending the best teen drug and alcohol treatment facilities. Quality treatment for alcoholism in teens will take their unique needs into account. Given that teens are in a different stage of life than adults, and they are mentally and physically different, both their rehab facilities and their families need to consider how their needs differ from traditional rehab patients and how they can meet these requirements. Guidance: Teens are still in a stage of life where they do not fully think for themselves. Navigating an addiction is difficult even for adults, and teens require heavier guidance to be successful in getting clean. Monitoring: Teens are less likely to hold themselves accountable if left to their own devices. It is up to the adults in their lives to monitor them closely enough to spot the signs that something is wrong while giving them space to not feel suffocated. Structure: Every parent has been told at some point how vital structure is in children’s lives. While a teenaged addict may not be a little kid, they still need this structure—possibly now more than ever. Safety: While adults in recovery can craft their home environment in a way that supports staying clean, teens do not have that control. It is up to the adults in their lives to make home a safe place for them to get and stay clean. Strategies for School: Finally, while adults can change their place of work and get away from the peers that encourage them to drink, teens often do not have that choice. They need strategies for dealing with peer pressure at school, and possibly within their neighborhood. Whether voluntary or court-ordered alcohol treatment, successful rehab programs for teens must keep these needs in mind. If a parent or caregiver suspects that a teen might have an alcohol problem, it is imperative that they get them help through a rehab facility. The risks teen drinkers face are too great to simply ignore the problem. Even when a parent or caregiver recognizes that a teen needs to get clean, they can struggle in supporting them in the right way. This is why adults must be active in the treatment and solution for teen alcohol abuse. By working directly with the therapists guiding the treatment plan for a teen with alcohol and drug problem, loved ones can discover ways to provide support. Family program drug and alcohol treatment facilities are a great resource for loved ones. Rehabs are likely to suggest similar strategies no matter which facility is chosen. The first is to take a step back and understand that the teen must be in the lead for their recovery. An adolescent who can only remain sober if controlled by an adult will relapse once away from home. Caregivers must help teens remain active in their aftercare. Because teens can struggle with prioritization and may not have the transportation needed, the adults in their lives must get them to their alcohol therapy sessions. Parents and loved ones also need to be ready to listen to their teen actively. Life is busy, and people are surrounded by more distractions than ever. Still, if a teen in recovery is talking, they need to be heard and validated. The family of a teen in recovery also needs to craft a home environment that is free of triggers for alcohol use. For example, if the teen drank to cope with arguments at home, the family needs to seek therapy to resolve the issues causing fights. If there is alcohol in the home, it must be removed. In some cases, adults are unable to provide the right home environment, possibly due to their own addiction or other struggles. It is vital that parents are willing to acknowledge their own shortcomings and seek out alternative living situations if needed. There are sober living homes open to adolescents, which might be the best alternative. If the teen is not resisting the idea of treatment, it is also a good idea to get them involved in the selection process. The more empowered the patient feels, the more likely they are to succeed. Those in need of teen alcohol treatment are often unable to seek it out themselves. Just the number of facilities available can make the process seem overwhelming. However, help is out there, and there are ways to find the right facility for the teen patient. Do not hesitate to reach out and get the rehab care needed.